My friend G.F.B. sent me this link to a fascinating 13-minute film from 1905 (or 1906) shot from the front of a cable car traveling down Market Street to the Ferry Building. If you've visited San Francisco, you know the Ferry Building is still with us, despite the 1906 earthquake/fire which leveled most of central San Francisco. Since the first 90 seconds are almost unwatchable due to vertical hold problems, I recommend letting the video load and then skipping to 1:30 to start watching. What never ceases to amaze me is how many people seem to have forgotten that great cities flourished without fossil fuels. The capital of the wondrous Tang Dynasty in China (near present-day Xian) contained upwards of 1 million people circa 700-900 A.D., and was a complex entrepot of trade and treasure from distant lands. The great Thai capital of Ayuttaya also had nearly a million residents in the 1600s and early 1700s before it was sacked and burned by the Burmese army; Westerners had carved out their own small quarters in the sprawling city. Paris and the other great cities of Europe thrived in the same timeframe (1600s and 1700s) without fossil fuels or high energy-density consumption. Those who expect (and become furious when their quasi-religious "faith" is questioned) a decline in energy availability to immediately lead to violent chaos overlook how similar life was in 1905 San Francisco, when coal generated (by today's standards) modest amounts of power and biofuel transportaion (i.e. horses) were the common form of drayage. Yes, there are plenty of jalopies (autos) careening through the traffic (you will see the same car weaving through traffic again and again, supposedly because the film-makers wanted the streets to look bustling and prosperous) but note the wealth of transport options. An endless string of cable cars moves up and down Market Street (that they are cable cars is evidenced by the cable trough running between the rails). To the right, a procession of horse-drawn carts and wagons head down toward the Bay--the 1905 equivalent of today's diesel trucks. 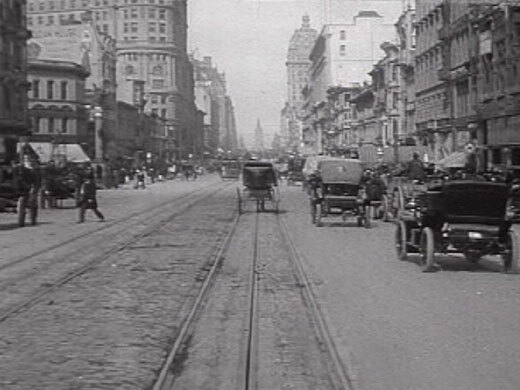 Toward the end of the film, as the trolley approaches the Ferry Building, you can even see a small horse-drawn trolley crossing Market Street. Electric trolleys (note the overhead arm to the conducting wire) crossed the street numerous times. You will also see many people on foot--still a reliable mode of transport, as well as bicyclists and an occasional rider on horsesback. On several occasions, people are almost struck by cars; pedestrians, as in Third World countries today, had to keep their wits about them. Those unfortunate enough to be struck very likely did not sue the city or the owner of the vehicle; if you couldn't manage crossing the street competently, then it was assumed you knew better than to try. There are no street lights or even police guiding traffic. This will remind those who have traveled in so-called Third World countries ("developing economies") of the semi-chaotic traffic which is commonplace outside the First World. To the First World resident accustomed to being told what to do and ordered about at all times, this seems like madness. But notice how it all works quite well without a huge costly structure to organize and control conformity. Indeed, it is a truism of city-street traffic control that people drive more cautiously and thus more safely when there are limited or no traffic controls. Note the pace of travel via trolley is a slow trot (roughly 8-10 miles per hour), probably faster than much of today's auto-centric traffic. Yes, the world of 1905 was filled with social injustices, and the overcrowded ghettos of South of Market and Chinatown were wretched. But this film reveals how prosperity was not yet dependent on high consumption of fossil fuels or a transport system totally dependent on oil. While steam ships powered by coal were the norm in 1905, the age of sail was still within living memory, and there were still old cargo ships (hauling lumber and the like) which were powered solely by sail. We should also ponder where the food and hay came from to fuel the people and drayage animals in 1905; the farms did not yet depend on petroleum-based fertilizers and the transport was largely water-borne. The population of San Francisco in 1905 was roughly 400,000--the 1900 Census pegged the number at 343,000. Thus the population was about half the modern total. But we should recall that much of modern-day San Francisco ("the Avenues", etc.) was still sand dunes in 1905. Our present culture cannot grasp the potential of energy devolution. When I heard James Howard Kunstler speak a few years ago, he observed that many people approached him expecting a pat on the back for buying a Prius. Jim noted that these souls did not yet "get it"--the automobile-centric and suburban, auto-dependent economy and culture was the problem, and the Peak-Lithium auto was not much different from the Peak-Oil vehicle. From a very basic point of view, the more transport options that are available, the better; just as mono-culture crops lead to disease and crop failures, so mono-transport systems lead to extreme vulnerabilities. In both case, the "modern" impulse is to "fix" the vulnerabilities created by mono-systems with more engineering (bio, tech, etc.). Then as these "fixes" trigger more unforeseen consequences, another round of ever-more complex and costly engineering is applied to "fix" the "fix." This is how systems become so high-energy, high cost and complex that the returns of further investments become ever more marginal, and the system eventually collapses under its own weight. The idea that a great city could depend largely on human power, animal power, water-based transport and central (energy-efficient) transport strikes those inculcated with the "modernist" religion/mindset as "primitive." Oddly enough, if we were able to go back in time and ask the passersby on the streets in 1905 if they were living a "primitive," "deprived" life in a "chaotic" city, they would very likely have reckoned that you had lost your mind. Perhaps we have collectively "lost our mind." Perhaps what we need is not a new technology but a new way of living that uses existing technologies to echo "old ways" that worked rather well on much lower energy densities and much lower energy consumption. Thank you, Steve R. ($50), for your outrageously generous contribution to the site via mail. I am greatly honored by your support and readership. Thank you, Randy G. ($10), for your most-welcome generous contribution to the site via mail. I am greatly honored by your support and readership.